I thought it would be appropriate to mention with this ongoing cold spell, the first test of the Winnipeg Street Railway (WSR) with electric cars was January 27th, 1891 (118 yrs ago!) at 7.30pm. This test occurred on River Ave, or the “bush of Fort Rouge” as city council was fearful of electric wires overhanging the streets. This was the first electric commercial streetcar operation in Canada. Until then, the Streetcars where pulled by horses on the rails. I have yet to find pictures of this event, however we do have a despriction, from John Bakers book “Winnipeg’s Electric Transit” p. 15. 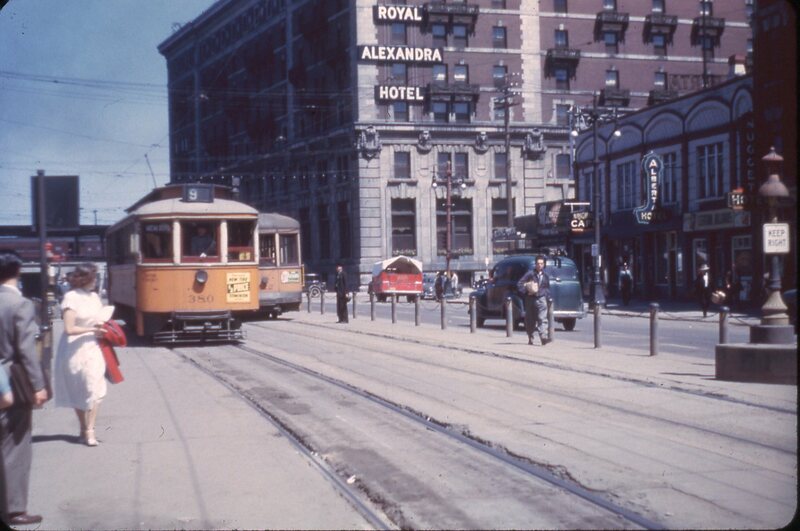 I wonder how cold it was in that first Streetcar…..
“Punctually at 7:30pm, Acting Mayor Taylor raised the trolley pole to the wire and the car was brilliantly illuminated by the five incandescent lights mounted in the ceiling. Some of the awestruck crowd surged forward to give closer inspection to the interior. Austin explained the operation of the signal bells and the electric heater to his guests and then gave the order to proceed”. 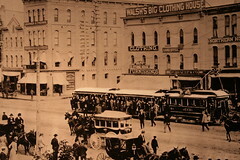 This picture is for the new entrant, authorized by city council, and their opening Sept 5, 1892, for the “Winnipeg Electric Street Railway” in front of City Hall. The 2 firms did merge eventually in 1894 after some ‘fierce’ competition for fares and customers. Older pictures from this time actually show 4 separate sets of railway lines, 2 for each company, per City Council orders.